One of our Youth Ambassadors, Kiara Carrion, had her fashion line, Kitara featured in Harlem Fashion Week! Kiara continues to impress us with her amazing perseverance and dedication at such a young age! 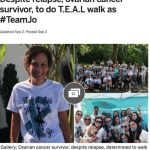 Read below about her inspiration behind her beautiful, teal, designs.